Despite the large 10-inch LCD screen size, the Mustek MP100 is a bit of a lightweight, weighing in at an extremely portable 1,230g. Sadly, it's not the only area where this portable DVD player is a bit on the light side. To get things started, just flip up the screen and the MP100 shows off a neat button layout and central disc-loading tray. Two speakers are placed at opposing corners at the bottom of the screen. The flimsy looking MP100 mercifully comes with a robust carrying case, offering some protection while on the move (and doubles as a harness for in-car use too). Batteries are recharged in situ, and allow you to watch one regular-length movie before they're depleted. After this, the unit needs to be connected to a power source. A 12V adaptor for in-car use is also provided. A memory card slot enables the playback of pictures and music stored on either SD or MMC formats from an MP3 player or digital camera, and there's a USB port too. 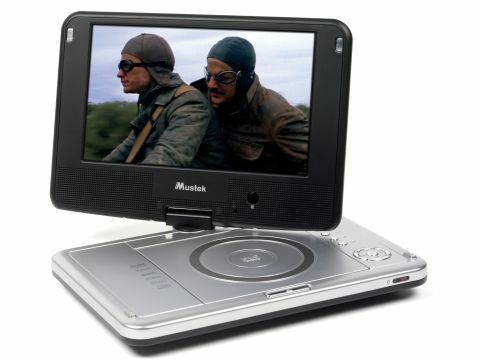 Like all portable DVD players, the MP100 can easily fit in to an existing home cinema system: composite video, S-video and component video connections are on offer for hook up to a TV screen. There's even a digital coaxial output for routing Dolby Digital and DTS soundtracks through a surround sound amplifier, but you'll need to buy an appropriate interconnect lead separately. In-ear headphones are provided for personal movie or music listening, and there's a second headphone jack. Ominously, there isn't any mention of screen resolution on the specification sheet. And our fears were confirmed while watching The Motorcycle Diaries. Images are grainy and have a limited angle of view despite the flexible positioning capabilities of the 180° swivelling screen. Brightness and colour levels are adjustable, but that's all. The low-resolution screen is also plunged into darkness during the movie's shadowy sequences. Images fare better when they're connected to a big screen via the progressive scan enabled component video output, but they still lack refinement and look rather noisy during dimly lit sequences. There are no sound settings but the tiny speakers handle dialogue well, and voices are clear. The speakers are a bit bass shy: you'll be glad of the supplied in-ear headphones, which produce a much fuller sound with movie and music soundtracks. The 10-inch LCD widescreen makes the Mustek MP100 one of the largest on the market. Its price and large screen size make it an attractive model. But as a portable DVD player it's too flawed for movies on the move. Images are only just watchable at times, and the poor 2hr battery life means that you'll only get through one full-length movie between recharges.